"Like I suspect many of the self-employed, my day starts with breakfast and a couple of hours on the email and doing general admin stuff. Before you know it, it is 11 o’clock and I am still in my dressing gown. I feel both pleased and guilty about this, pleased that I am my own boss and can get away with this and guilty for being so slovenly. 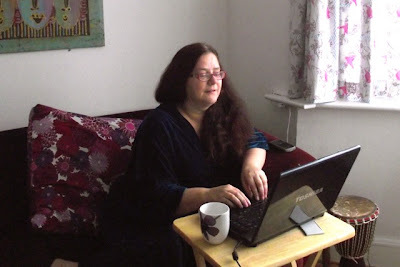 Oh yes and as this is a sewing blog, I feel that the dressing gown deserves a special mention. It’s a Vogue pattern which I bought probably around 30 years ago. I have made it up in uncool but very comfy velour and worn it to destruction three times over. Lunch is usually home made soup and a sandwich, I tend to eat it at home and then hit the studio some time in the afternoon. The studio is comfortable and feels like my second home, but I can’t be there all day, all night and all weekend too. Occasionally I will meet a friend for lunch - I really enjoy being ‘a lady who lunches’ as I work so much in the evenings. 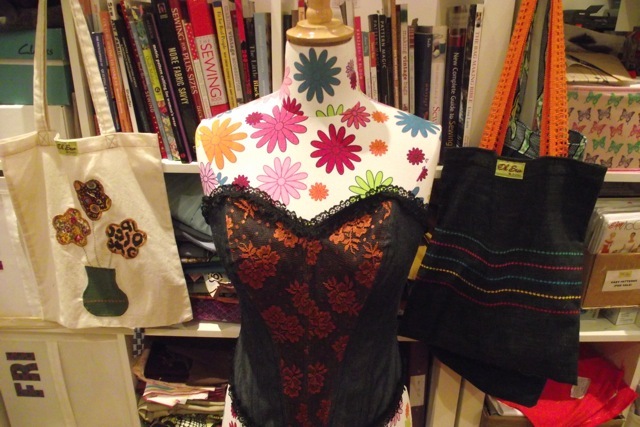 Afternoons are usually more about sewing or planning classes. I have a beautiful, spacious, sunny studio which I am able to mess up completely in about half an hour flat. I realised very quickly that actual step-by-step samples work ten times better than handouts, but these are very time consuming to sew. I often get asked whether I make all my own clothes and my answer is that I don’t really have time any more and miss my hobby dreadfully. 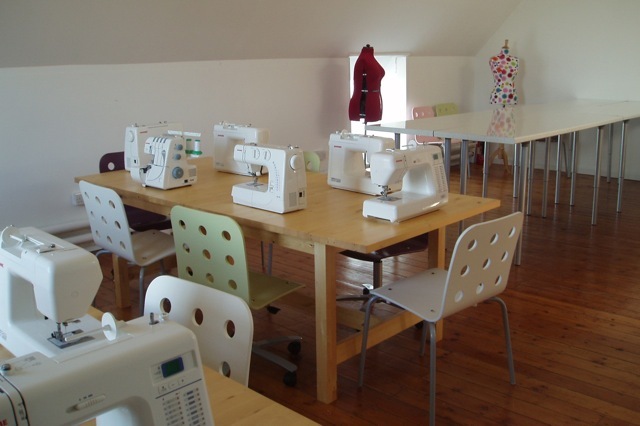 We specialise in beginners dressmaking and our challenge is to get people new to sewing into a wearable dress in 6 sessions. Managing people’s different expectations and abilities, not to mention body shapes and fabric choices is really really difficult. Three years down the line, I think I’m doing pretty well, but I’m beginning to wonder about whether commercial patterns are the best way forward – they rarely fit that well and no-one except me can make head or tail of the instructions. What am I working on at the moment? Still struggling to find a foolproof way of getting around those double G cups that keep on walking into my classes. I’ve about mastered the Palmer Pletch Full Bust Adjustment, but I’m not keen on the ‘tissue fitting’ stage (sellotaping the pattern together) as think this only works on a more relaxed fit. I’ve got a couple of software packages which are really interesting but I need to try them out on lots of different body shapes. And I’m saving up for a 3D body scanner – only £40,000 so I’m told! 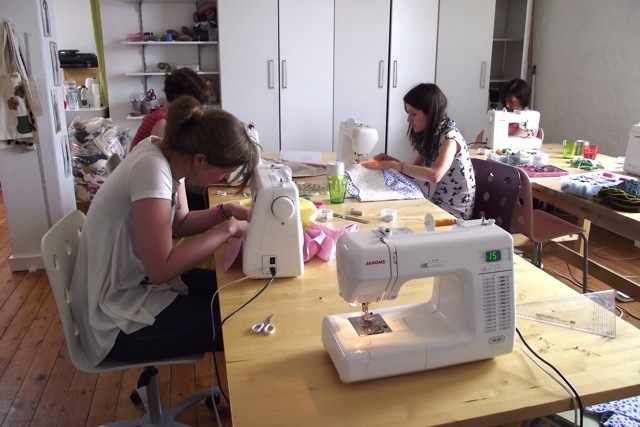 Although I have sewn since the age of 12, before I set up Oh Sew Brixton I had a different career in marketing, specifically market research and strategic planning. I worked freelance for the last 15 years of this part of my life and also owned a couple of clothing shops (in Brixton and then Camden) which catered to my creative side. 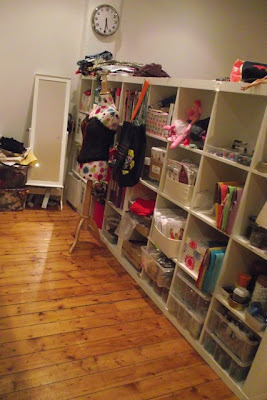 For my first year of trading at Oh Sew Brixton, I worked all day, all night and all weekend, I didn’t stop and I didn’t do anything else. My business background stood me in very good stead, but you also need a slightly obsessive compulsive personality to get a new business up and running. I didn’t set out to make a fortune from the school and it really isn’t possible to make more than a modest living, particularly with London rents. Most of my students are professional women in their late 20s and early 30s, although I currently have an 11 year old in one of my classes and a 60 year old in another, so I remain true to my ‘everyone is welcome’ policy. Yes, the odd man passes through – they come often because they have something they want to make (usually something top secret made out of outdoor fabric), or have an interest in fashion, but my favourite student was an ‘occasional cross-dresser’ who was signed up by his wife. He was a little shy starting the class but when he confessed he was there to make dresses, his fellow students (bless them) all squealed with excitement! What have I learned about myself? I have learned to rein back my naturally rather dry humour, encouragement and enthusiasm are much more productive, although ‘Do you really want to sew your armholes together?’ does very occasionally still pass my lips. Rather surprisingly, I have developed infinite amounts of patience. The point of teaching is to teach and if people don’t get it, it’s your fault for not explaining it clearly enough. So if you have to go over something three different ways, that’s absolutely fine. Lastly, I know I need to be Mrs Calm in all circumstances, as this is by far the best way to deal with high flying city bankers getting frustrated when all doesn’t go to plan. If I’ve run an evening class, I drag myself across the road for the 5 minute bus journey back home. I eat something light and healthy for supper as I know I should, and then fill up on far too many biscuits. I have a HD recorder which means I can watch Home and Away at 10 o’clock at night which embarrassingly seems to be the perfect wind down viewing for me. I go to bed somewhere between 11pm and 12am, but know that I don’t have to use my alarm clock any more – one small advantage of my current lifestyle is that my earliest start is 10am and my studio is only 10 minutes away from my house. 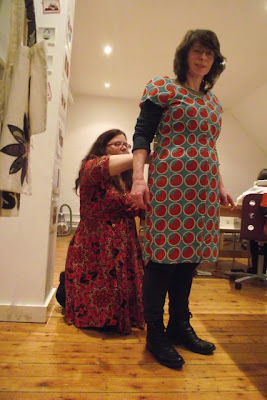 Dressmaking is more difficult than people anticipate and not everyone gets it, or will make time for it in the future. But when you see that you have started someone on a hobby that will be with them for the rest of their life, it’s hugely satisfying. Oh and did I mention that I was the one who taught Tilly to sew?"